One afternoon in the fall of 1939 in the small town of Alexandria, LA, a skinny six-year-old boy peeked shyly round the wide gate of a bus company maintenance depot. In the big yard, a large-framed black man was busily washing bus windows. The little boy watched him for a time, too timid to approach until summoned. His family, after all, had forbidden all contact with his estranged father. The man noticed his son soon enough, for the visit was not entirely unexpected. Little Hal had been sneaking by for almost a year now, and whenever he could spare it he would slip the boy a nickle or a penny. Today he had something special for him. "C'me're, sport," he said with a grin and a wave. It was the signal Hal had been waiting for, and he ran forward, smiling. "How you doin'?" his dad asked, pausing in his chores. "Yeah?" The man withdrew a brown paper bag from his coat pocket and handed it to the boy. "Here," he said. Hal took the proffered packet curiously. The week before, his father had asked if there were anything special he might like, and he had immediately answered, "A B.B. gun!" Hal Sr. had smiled; they were all the rage with kids just then. But they were also well beyond the means of a poor black man who earned pennies an hour cleaning buses. So he'd done the best he could. Hal could see the bag was too small to contain a B.B. gun, but he opened it excitedly anyway, and pulled out the most marvelous toy he'd ever seen: a genuine Buck Rogers ray-gun pistol. Its space-age design was weird and wonderful, and when he pulled the trigger sparks inside illuminated red cellophane around the breech. "Wow!" he said. The gun would soon be dismantled to satisfy Hal's curiosity as to how it worked. Within a few years the boy would move to California with his mother and stepfather, never to see his real father again. On August 1, 1969, a tall, pleasant-featured black man of 36 manned a powerful laser at the Lick Observatory in Santa Clara, CA. At his command a pulse of concentrated coherent light shot toward the moon, aimed at a mirror placed on the lunar surface by Apollo 11 astronauts Buzz Aldrin and Neil Armstrong. The reflected beam was timed by sensitive detectors here on Earth, for the first time measuring to within five meters the exact distance between us and our nearest planetary neighbor. Hildreth (Hal) Walker Jr. had come a long way since his father had given him a toy ray-gun 30 years before. Whether due to accident, instinct or design, his father's gift presaged what was to become a remarkable career in science—one that overcame many hurdles and pitfalls. Hal Walker grew up in the institutionalized segregation of the Deep South before the Civil Rights movement. Opportunities for young black men to do anything other than menial labor were practiclly nil. In Louisiana, though, Hal managed to befriend the only white residents of his poor neighborhood, an Italian family that owned a vacuum cleaner repair shop. Free time spent watching the repairman rebuilding and rewiring the machines was his first brush with the mechanics and electronics that fascinated him. Later, in a Los Angeles junior high school, he was fortunate to have a kindly workshop teacher named Mr. Dietz who recognized the young student's aptitude for mechanics and electronics, as well as his determination to master and improve anything he touched. At this time, too, between the ages of 13 and 15, Hal befriended several fellow students who shared his love of electronics. This was the age of do-it-yourself crystal radios and simple motor kits, and the budding scientist experimented with everything he could get his hands on. "I got shocked a few times," he says now with a laugh, "but it taught me the power and potential of electricity; the rules of action and reaction." Also during this period, largely thanks to his teacher, Hal became interested in the movie industry—not in front of the camera, but behind it. Filming technology transfixed him, and he wanted to work with the cameras. Upon graduation from high school, he planned to apply for a job in the film industry. But it was not to be. Because he was black, the industry unions stonewalled, not even permitting him to work as a lowly projectionist in the cinema. A promising door was slammed in his face. After a period of confused despair, Hal picked himself up and decided to enter the military; at least there he might have a chance to work in technology. By 1951, the Korean War was making itself felt even in Hal's neighborhood, and he joined the Navy, hoping to serve on one of the giant aircraft carriers that had long intrigued him. This wish, at least, was granted, and four years later he left the Navy as a qualified electrician's mate. He now had his first professional status, his first real-world experience outside the US, and the key to the door of higher education: the G.I. Bill. While considering the next rung of the ladder he proposed to climb, a chance meeting with a recruiter from Douglas Aircraft Co. opened a door for Hal. He took a job installing radar systems on US Navy jet fighters. By 1955, at last gainfully employed as a technician, he started taking night classes in electrical engineering at L.A. City College, married, and started a family. The future looked rosy. But the end of the Korean War and consequent downturn in the aviation industry signalled layoffs for all but he most senior researchers at Douglas. The company's 'old boy' network closed ranks and, once again, Hal found the door slammed in his face. "Once again I experienced racial prejudice," he now recalls candidly; "that I would not be permitted to be what I knew I could be." At 26, unemployed and bitterly discouraged, Hal gave up and "went back to the street." He quit college amid family troubles, and for a time assumed the role of the angry manual laborer, sure that all doors were closed to him. But some spark prevented Hal from throwing his life away altogether. While working odd menial jobs, he kept a watchful eye on the want ads. One day he noticed that RCA was looking for contract workers with experience in electrical engineering. True, it was only employment on a job-by-job basis, but it was better than unrewarding manual labor. Mustering his resolve, he picked himself up, went to the local RCA field office and applied. Hal's prior training was more than sufficient to qualify him for a contract position, and he soon found himself doing hands-on field engineering with missile computer systems. As would prove very much to his benefit, RCA conducted regular job evaluations on all its workers, and Hal scored consistently high marks. "One day I got this letter from RCA headquarters in New Jersy," Hal recalls, "asking if I'd be interested in working on the BMEWS program full time." The Ballistic Missile Early Warning System was a US Government project in which RCA was deeply involved. The job, as a field service engineer, would require Hal to undergo psychiatric evaluation, security clearance, and move to remote Clear, Alaska for 18 months to work on one of three huge monitoring stations (the other two being in Greenland and England). Needless to say, Hal jumped at the offer, and within a few months became the first black technician on a team of nearly a thousand people dispatched north to construct and test the apparatus that would give America up to 30 minutes warning in the event of a Soviet nuclear attack. At long last, Hildreth Walker Jr. was doing work of critical importance, and was fully employed in the field he loved. From BMEWS, he never looked back. Over the next two decades, Hal's acute technical and managerial skills kept him busy in global satellite-relay television communications with Space Technology Laboratories; developing laser products utilized in industry and medicine, plasma and quantum physics and holography with Union Carbide's KORAD Laser Systems. Later, in 1969, Hal was responsible for operating KORAD's powerful ruby laser used in the Apollo 11 Lunar Ranging Experiment (LURE). In 1981, Hal was a member of the Hughes Aircraft team that brought Laser Target Designator Systems (LTDs) into the US Army's weapons inventory. As testament to the enduring need for technological innovation, as well as his own perseverence, veteran technician Hal Walker today is deeply involved with the nationwide effort to convert from internal-combustion to electric-powered automobiles. This is a challenge that requires more than mere technological know-how. Indeed, it demands not only a knowledge of the mechanics of battery-operated vehicles themselves, but an understanding of the support structures that enable us to conveniently motor around in our environmentally-unfriendly fossil fuel-guzzlers now. In other words, it's a challenge tailor-made for Hal. As part of a team of predominantly African American entrepreneurs, Hal is working to put in place a network of "filling stations" that would be to the electric car-driver what gas pumps are to us today; namely, a place where one can quickly and conveniently supply one's energy needs and keep on going. As a board member of BESCI Inc., Hal is involved in a city-, state-, and nation-wide plan to establish a network of service facilities that would replace used electric car batteries (which currently have a range of between 40 and 70 miles) with newly charged ones, rather than force drivers to wait as much as an hour to charge up the batteries in their vehicles. This is a complex, massive undertaking, involving the use of robotic mechanics to handle the batteries, as well as cooperation between government and corporate agencies. And, of course, Hal's old friends the lasers continue to command his attention. Now more than ever his experience with laser systems, and his expertise in project management, are in demand to develop what may well be the next important source of energy for our energy-hungry nation: nuclear fusion. At the Lawrence Livermore National Laboratories, researchers are trying to perfect a massive laser system that would generate a concentrated beam of ultra-violet light to provide the power necessary to drive atoms together with sufficient force to produce the equivalent of energy formerly only available through nuclear fission—the splitting of atomic nucleii, or fission. Getting such a beam of concentrated light to work, however, requires highly specialized components, many of which are not readily available on the national market. Here, once again, Hal Walker's knowledge and experience are in demand; and his expertise as an entrepreneur—his ability to understand, then buy and sell this vital technology—is proving indispensible. 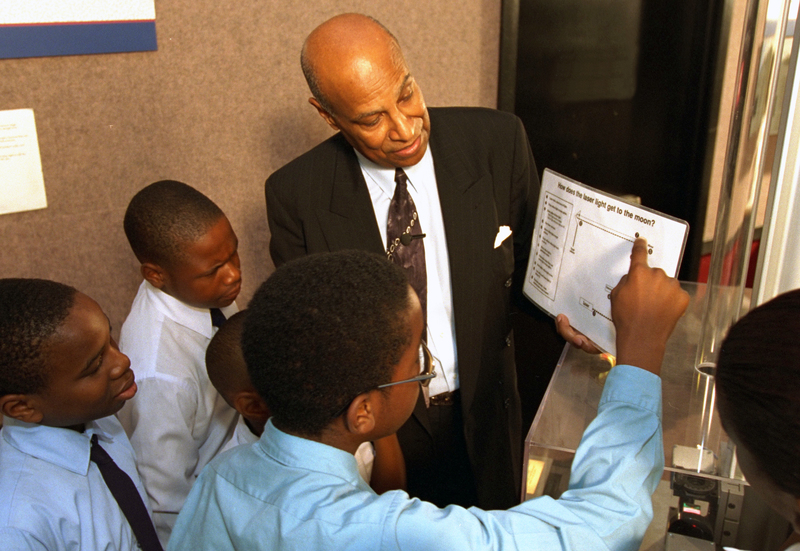 Hal Walker explains how the moon is illuminated to a group of students during an Innovative Lives presentation at the Lemelson Center in 1995. Smithsonian photo. Since retiring from Huges Aircraft Co. in 1989, Hal and his wife Dr. Bettye Davis Walker have co-founded the African-American Male Achievers Network, Inc., or A-MAN. This non-profit organization based in Los Angeles has two components: one emphasizes the sciences and higher learning for young black men, as well as counseling and critical evaluation of the social problems these young minorities face. The other is the Science Discovery and Learning Centre, which tries to provide boys and girls with the technological know-how they'll need to compete in the 21st century. With his background, it's hard to imagine someone better equipped for such an effort. "What I'm trying to do," says Hal, "is pass the torch to younger black people. There's a great need in the black community for involvement in technology, so we can begin to solve some of our economic ills and better engage society at large. In my experience, an awareness of how things work helps an individual to master events around him; to have some say in his livelihood. At the very least," he says, "I want it to be an option for young black men—something other than athletics or, in the worst case, drugs and gang activity." After more than eight years conducting research on the outside forces and peer pressures that too often mold the young black men and boys of his Los Angeles community, Hal is quite blunt and uncompromising as to what he perceives to be the problems: "A lot of our young people have an uncomfortable identification with aggression in sports—one-on-one basketball, that sort of thing. They assume maths and sciences to be automatically beyond their comprehension and not beneficial to their involvement with society. So their priorities are skewed. "What we have to do," he says, "is get them to recognize that they have an intrinsic value, and that with work will become valuable to society. I tell them that even when you're struggling—for whatever reason—you must remember to believe in your own self-worth." Once, fed up with fielding questions as to the relative monetary merits of science vs basketball, this emminent electrical engineer whose work was recently honored in the Smithsonian's "Science In American Life" exhibit, exclaimed to a group of kids: "What if you suddenly woke up and there were no basketballs on earth? Would any of you know how to make one?" Hal chuckles. "That made them think a bit. I told them, 'Hey, all of us can't be great players. Some of us have to produce the balls!' That seemed to get their attention." Hal Walker's life is a lesson in hard work and conviction; the story of how a person might grow from a boy with a cheap Buck Rogers ray-gun pistol, to a man possessed of knowledge and sophistication only dreamed of in his youth; from toys that pretended to powers existing only in fiction, to technologies surpassing the dreams of humankind barely 50 years ago. And America needs more of the same if we are to compete effectively in an ever more technological world. On June 1, 1995, Hal Walker kicked off the Lemelson Center's "Innovative Lives" series. Walker, a former aerospace engineer, owns Tech Plus, a Los Angeles firm specializing in laser systems and electro-optics. He is also a co-founder of A-MAN, Inc. (African-American Male Achievers Network). Walker shared his ideas on innovation as a career and explained his research on lasers and his developmental work with electric automobiles, a technology he calls "the wave of the 21st century." Afterwards, Walker, National Institute of Standards and Technology chemist John Travis, and the staff of the National Museum of American History's Hands On Science Center illustrated the properties and applications of laser light. Students participated in these demonstrations of how lasers are used to make music in a CD player, measure the distance to the moon, carry voices over telephone cables, and help doctors heal the sick.